Department of Chemistry and Biochemistry, Faculty of Applied Sciences, University for Development Studies, Navrongo Campus, Ghana. ABSTRACT: Purpose: Anacardium occidentale (Cashew) has been used by Folk medicines as a remedy for many diseases. In this study, we investigated the ameliorative activity of methanolic stem bark extract of Anacardium occidentale. Methods: Blood samples of the rats from each group were collected by tail bleeding for baseline biochemical test to know the state of the animals’ liver before the inducement of the injury. 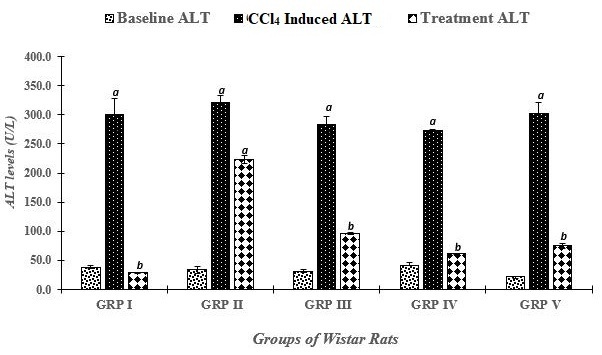 Thirty (30) Wistar rats were induced with CCl4 (1.5 ml/kg, b.wt, 20 % CCl4 / olive oil) for five days before treatment with the extract. After induction, elevated levels of the serum aminotransferases (ALT, AST), ALP and the decreased levels of ALB as compared to the enzyme markers levels before the induction of liver injury with CCl4 indicated hepatocellular injury. Results: Administration of the methanolic extract of Anacardium occidentale of different concentration (250, 500 and 1000 mg/kg b.wt oral) for five days reversed the impact of CCl4 toxicity significantly (P<0.05) on the serum markers ALT, AST and ALP of the damaged liver as compared to the negative control groups (groups administered with Normal saline). Treatment with the methanolic extract resulted in decreased levels of ALB in the blood of the rats. Discussion: The results of the study indicated that methanolic extract of Anacardium occidentale bark may possess a liver damaged curative property, which may be attributed to the presence of the phenolic compounds in the extract as shown in the phytochemical screening. INTRODUCTION: Liver is the most important organ regulating homeostasis in the body 1. It is required in biochemical pathways related to growth, fight against diseases and involved in energy provision. Besides its physiological functions, it also defends against the dangers of toxic drugs and other chemicals by metabolism. During metabolism, excessive free radicals are produced and may cause liver injury 2. Free radicals such as hydroxide (·OH) and oxide (·O) are produced as a result of the activity of the metabolizing enzymes in the liver (cytochrome P450) which readily attack the polyunsaturated fatty acid of the lipid membrane of hepatic cells, initiating a self-propagation chain reaction 3, 4. This eventually leads to liver damage. Liver injury is detectable by clinical signs (jaundice, swollen and tender liver), biochemical alterations (elevated levels of hepatic enzymes in the blood, loss of enzymic activities in the liver), or histological examination. Elevated levels of serum enzymes alanine aminotransferase (ALT), aspartate aminotransferase (AST), alkaline phosphatase (ALP) may provide evidence of hepatocellular injury in the absence of clinical signs and histological examination 5, 6. Medicinal plants have gained much attention as an alternative medicine useful for treatment, prevention or both of life-style related disorders 7. They are used to treat a wide variety of diseases and are potential natural hepatoprotectives and antioxidant compounds in the treatment of liver diseases 8. Anacardium occidentale (Cashew) is a tree in the family of Anacardiaceae. This family contains 73 genera and about 600 species of which cashew is by far the most important economically. It is a multipurpose tree that grows up to 15 mm high. This specie (Anacardium occidentale) has been in use as a cure for some diseases. Extracts from root, stem and fruit of Anacardium occidentale have been used by countries’ folk medicines as a remedy for many diseases such as eczema, bronchitis, cough, veneral diseases, as well as impotence and syphilis-related skin diseases 7, 9. Anacardium occidentale possess phytoconstituents such as saponins, tannins and flavonoids, which have been reported to exert antioxidant activities 10. Liver damage can be induced by various factors and hepatotoxins such as carbon-tetrachloride (CCl4), acetaminophen and ethanol 2. Here we used carbon-tetrachloride (CCl4) to induce liver injury in animal models to cause hepatic injury. In this study, Anarcadium occidentale was assessed in vivo for possible hepatoprotection on the carbon tetrachloride induced liver injury. Preparation of the Plant Powder and Extraction: The stem bark of A. occidentale was obtained from Wenchi in the Brong-Ahafo Region of Ghana in the month of April, 2017. Botanical identification of the plant was done at the Department of Applied Biology, University for Development Studies, Navrongo campus. The stem bark of Anacardium occidentale was air dried at room temperature for two weeks and ground into powder form with pestle and mortar. Seventy (70)g of the air-dried ground bark of the plant was macerated with methanol (95%) at room temperature for 72 h. After filtration, the solution was concentrated to a paste form using rotary evaporator. Test for Saponins: To 2 ml of the extract, 2 ml of distilled water was added in a test tube. The solution was shaken and observed for 15 minutes, the absence of a stable persistent foam for 15 min indicated the absence of saponin. Test for Reducing Sugars: The methanol extract (1 ml) was diluted with water (2 ml) and 1 ml of Fehling’s solution was added and heated. A brick red precipitate denoted the presence of reducing sugars. Test for Polyuronides: The extract, 2 ml, was added dropwise to 10 ml of acetone in a test tube. A thick precipitate was formed denoting the presence of polyuronides. Test for Phenolic Compounds: Drops of 5% Ferric chloride was added to 3 ml of extract. A sudden change in colour to black showed the presence of phenolic compounds. Test for Triterpenes: The methanol extract (10ml) was evaporated to dryness. The residue was then dissolved successively in acetic anhydride (0.5 ml) and chloroform (0.5 ml). The solutions were then transferred to a dry test tube. Concentrated sulphuric acid (2 ml) (Liebermann-Burchard’s reaction) was then added at the bottom. A reddish-brown coloration at the interface was not observed which indicated a negative result for triterpenes. Test for Alkaloids: The plant extract (0.5 g) was added to 5 ml of dilute sulphuric acid H2SO4 (1%) on a steam bath. The solution was filtered, and the filtrate was treated with a few drops of Dragendroffs reagent. Reddish brown turbidity or precipitate was not observed which indicated a negative result for alkaloids. Animals: A total of 30 Wistar rats (both male and female) weighing 160 - 301 g were obtained from the Center for Plant Medicine Research, Mampong, Ghana. The animals were maintained in an air-conditioned house at a temperature of 23 ± 2 °C. The animals were provided with standard feed and drinking water was also made available. All the experimental procedures were carried out in accordance with the guidelines of the Institutional Animal Ethics Committee. Experimental Design: The animals were randomly divided into five groups (I to V) with six rats each in (each group). Groups I and II served as positive and negative control groups respectively, and groups III, IV and V served as treatment groups with different doses of the methanolic plant extract. Blood samples of the rats from each group were collected by tail bleeding for baseline biochemical test to know the state of the animals’ liver before the inducement of the injury. Liver injury was then induced in all the experimental animals by the administration of carbon tetrachloride (1.5 ml/Kg of 20% CCl4 / olive oil) via subcutaneous injection for 5 days. Blood samples were collected on the 5th day, two (2) h after the administration of the CCl4 to test for liver enzyme markers to confirm liver damage. 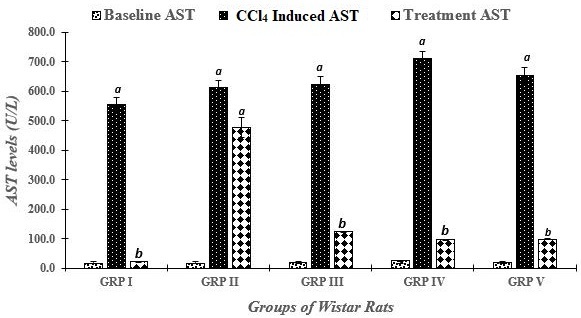 Group I rats were administered with silymarin (100 mg/kg b.wt) as the reference drug or positive control for next five (5) days whereas group II rats were given normal saline (as negative control). Rats in group III, IV and V were administered with 250 mg/kg b.wt, 500 mg/kg b.wt and 1000 mg/kg b.wt of methanolic cashew stem bark crude extract respectively for five days continuously. Determination of Serum Biochemical Parameters: At the end of the treatment period, blood samples were collected by tail bleeding from all animals. Sera were separated out by centrifugation at 3000 rpm for 5 min and stored at a temperature of 20 ºC until analysis. Liver damage was assessed by the estimation of serum activities of ALT, AST, ALP and total albumin using commercially available test kits. The results were expressed as unit / liter (U/L). Yield of Extracts: Seventy grams (70) g of the raw material was macerated in methanol (95%) and gave 19.72 g of methanolic stem bark crude extract of the plant. The percentage yield was 28.17%. Phytochemical Analysis: Phytochemical analysis of methanolic stem bark extract of Anacardium occidentale showed the presence of reducing sugars, phenolic compounds, flavonoids and polyuronides however, saponins, triterpenes and alkaloids were absent as shown in Table 1 below. Biochemical Analysis: The subcutaneous administration of CCl4 (20% CCl4 / olive oil, 1.5 ml/kg b.wt) gave a significant (P<0.05) elevation of the serum ALT Fig. 1, AST Fig. 2 and ALP Fig. 3, when compared to their respective baseline (day 0) values. Also, decreased levels of ALB Fig. 4 were observed after the injury was induced with 1.5 ml/kg/b.wt of 20 % CCl4 / olive oil. The levels of ALT, AST and ALP reduced significantly (p<0.05) when treated with silymarin and the methanolic stem bark extract of Anarcadium occidentale as shown in Fig. 1 through to Fig. 4. There was also a significant (p<0.05) increase in the levels of ALB Fig. 4. FIG. 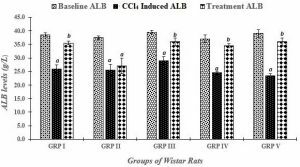 1: EFFECT OF METHANOLIC STEM BARK EXTRACT OF ANACARDIUM OCCIDENTALE (MBEAO) ON ALT LEVEL AGAINST 1.5 ml/kg OF 20% CCl4 / OLIVE OIL - INDUCED LIVER TOXICITY IN ADULT WISTAR RATS aP< 0.05; significant difference when compared with the Baseline ALT level; bP < 0.05; significant difference when compared with 1.5 ml/Kg of 20 % CCl4 / olive oil liver injury induction ALT: Alanine Aminotransferase; CCl4: Carbon tetrachloride, GRP I: Treated with silymarin, GRP II: Treated with Normal saline, GRP III: Treated with 250 mg/kg of MBEAO, GRP IV: Treated with 500 mg/kg of MBEAO and GRP V: Treated with 1000 mg/kg of MBEAO. FIG. 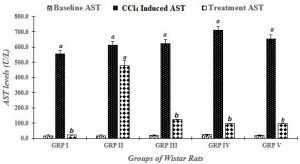 2: EFFECT OF METHANOLIC STEM BARK EXTRACT OF ANACARDIUM OCCIDENTALE (MBEAO) ON AST LEVEL AGAINST 1.5 ml/kg OF 20% CCl4 / OLIVE OIL - INDUCED LIVER TOXICITY IN ADULT WISTAR RATS aP< 0.05; significant difference when compared with the Baseline AST level; bP < 0.05; significant difference when compared with 1.5 ml/Kg of 20 % CCl4 / olive oil liver injury induction.AST: Aspartate Aminotransferase; CCl4: Carbon tetrachloride, GRP I: Treated with silymarin, GRP II: Treated with Normal saline, GRP III: Treated with 250 mg/kg of MBEAO, GRP IV: Treated with 500 mg/kg of MBEAO and GRP V: Treated with 1000 mg/kg of MBEAO. FIG. 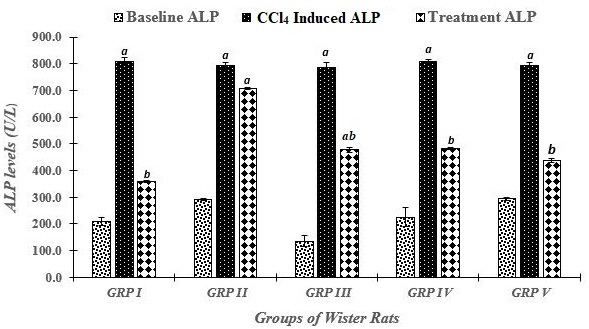 3: EFFECT OF ETHANOLIC STEM BARK EXTRACT OF ANACARDIUM OCCIDENTALE (MBEAO) ON ALP LEVEL AGAINST 1.5 ml/kg OF 20% CCl4 / OLIVE OIL - INDUCED LIVER TOXICITY IN ADULT WISTAR RATS aP<0.05; significant difference when compared with the Baseline ALP level; bP<0.05; significant difference when compared with 1.5 ml/Kg of 20 % CCl4 / olive oil liver injury induction.ALP: Alkaline Phosphatase; CCl4: Carbon tetrachloride, GRP I: Treated with silymarin, GRP II: Treated with Normal saline, GRP III: Treated with 250 mg/kg of MBEAO, GRP IV: Treated with 500 mg/kg of MBEAO and GRP V: Treated with 1000 mg/kg of MBEAO. FIG. 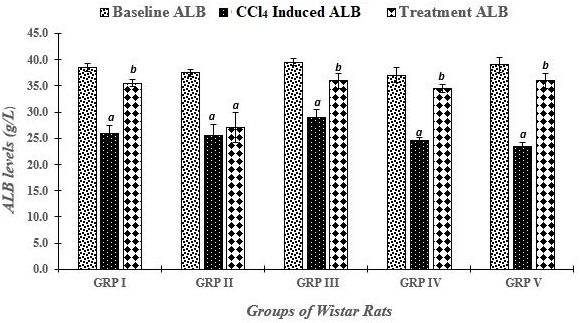 4: EFFECT OF ETHANOLIC STEM BARK EXTRACT OF ANACARDIUM OCCIDENTALE (MBEAO) ON ALB LEVEL AGAINST 1.5 ml/kg OF 20% CCl4 / OLIVE OIL - INDUCED LIVER TOXICITY IN ADULT WISTAR RATS aP< 0.05; significant difference when compared with the Baseline ALB level; bP < 0.05; significant difference when compared with 1.5 ml/Kg of 20 % CCl4 / olive oil liver injury induction. ALB: Albumin; CCl4: Carbon tetrachloride, GRP I: Treated with silymarin, GRP II: Treated with Normal saline, GRP III: Treated with 250 mg/kg of MBEAO, GRP IV: Treated with 500 mg/kg of MBEAO and GRP V: Treated with 1000 mg/kg of MBEAO. DISCUSSION: The yield of our extract was 47.01 % with 95 % methanol and jelly nature of the extract was observed. Phytochemical screening of the methanolic extracts of cashew stem bark revealed the presence of phenolic compounds, flavonoids, reducing sugars and polyuronides and the absence of saponins, alkaloids and triterpenes. The presence of phenolic compounds and flavonoids were also observed in 13, 14. Phenolic compounds have antioxidant activity 15. This activity is believed to be mainly due to their redox properties, which plays an important role in absorbing and neutralizing free radical 15, 16 as oxidative stress is a crucial factor in liver diseases 17. The presence of phenolic compounds in our extract may be responsible to provide antioxidant activity and reports on anti-inflammatory properties of the Anarcardium occidentale stem bark 18 - 20 and thus its hepatoprotective activity observed in this study. Liver injury marker enzymes levels (Baseline values) before the induction of liver injury indicated that the animals were without liver injury but the serum liver injury marker enzymes (ALT, AST and ALP) (Fig. 1, 2, 3 and 4) increased and a decreased albumin level after administration of 1.5 ml/kg of 20 % CCl4/olive oil were observed. It is well evidenced that acute hepatotoxicity can be induced by carbon tetrachloride (CCl4) 21. Carbon tetrachloride (CCl4) is a highly reactive halogenated molecule that has been used in experimental models of drug-induced hepato-cellular injury 22. CCl4 is metabolized by the cytochrome P450 family in the hepatic endoplasmic reticulum to form a highly reactive and unstable trichloromethyl radicals (·CCl3) which binds to the unsaturated fatty acids of the membrane lipid covalently, resulting in the formation of lipid radicals, thus initiating the chain reaction of lipid peroxidation within and outside the hepatic cells and cause liver injury 2, 23. In this study, liver injury was induced when 1.5 ml/kg of 20% CCl4/olive oil solution was administered to all experimental rats subcutan-eously. This dose induced a significant increase of the liver enzymes such as ALT, AST and ALP Fig. 1, 2 and 3 when compared to the respective baseline values. Also, the decreased amount of total ALB levels Fig. 4 induced by CCl4 is a further indication of liver damage, decrease in the number of hepatocytes which in turn may result in a decrease in hepatic capacity to synthesize albumin 24. Therefore decreased levels of albumin as recorded in CCl4-induced rats revealed liver injury and may be attributed to the damage produced and localized in the endoplasmic reticulum leading to decrease in protein synthesis 25. Silymarin is a well-established hepatoprotective drug, which is used as a reference drug for comparison of hepatoprotective activity of plants extracts 26, 27, 28, 29. The levels of the elevated biochemical parameters (ALT, AST, ALP) because of CCl4-induced hepatotoxicity, reduced by the administration of silymarin as seen in all figures, when compared to the baseline levels of the enzyme markers. Concentration of 250, 500 and 1000 mg/kg of methanolic stem back extracts were administered to the rats because Okonkwo and his colleagues reported that the methanolic extract of the plant under study has no toxic effect to the liver unless the concentration is above 2900 mg/kg 30. The administration of methanolic stem bark of cashew extract reduced the levels of the liver marker enzymes (ALT, AST and ALP) when compared to their levels when the liver was injured, the dose related fashion reduction in ALT in Fig. 1, indicated that the 1000 mg/kg was more effective against ALT than the 500 mg/kg and 250 mg/kg dose levels. 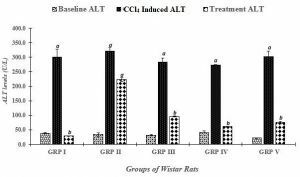 A reduction in the values of ALT and AST in the groups given only normal saline (negative control group) was observed, but not as much reduction as the groups treated with the extract and silymarin. This reduction may be attributed to normal healing of the animal liver. Both ALT and AST are commonly thought of as liver enzymes because of their high concentration in hepatocytes, however, ALT is marked specific for liver function. ALT is specifically produced in the hepatocytes, making it relatively more specific to hepatic function compared to AST, which is present in variety of tissues such as liver, muscles and red blood cells 31. 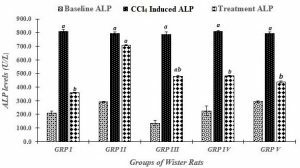 CONCLUSION: The investigation on the hepatoprotective activity of A. occidentale against CCl4 - induced hepatocellular damage revealed that the administration of the methanolic extract has reduced the impact of CCl4 toxicity on serum biochemical liver marker enzymes (ALT, AST, ALP). Thus, the results of the study indicated that methanolic extract of Anacardium occidentale bark may possess a hepatoprotective and a curative activity, which may be attributed to the presence of the phenolic compounds in the extract and can be explore for liver disease management. ACKNOWLEDGEMENT: We would like to acknowledge researchers of the Centre for Scientific Research in Plant Medicine (CSRPM) for their valuable information and guidance, which helped us in completing this task through various stages. Heymann F and Tacke F: Immunology in the liver - from homeostasis to disease. Nature Reviews Gastroenterology & Amp; Hepatology 2016; 13: 88. Clària J, Horrillo R, Martínez-Clemente M, Morán-Salvador E, Titos E, González-Périz A and Ferré N: Basic mechanisms of hepatocellular injury. Role of inflammatory lipid mediators. Gastroenterología y hepatología 2008; 31: 682-692. Pisoschi AM and Pop A: The role of antioxidants in the chemistry of oxidative stress: A review. European journal of medicinal chemistry 2015; 97: 55-74. Cederbaum AI: Role of Cytochrome P450 and Oxidative Stress in Alcohol-Induced Liver Injury. Reactive Oxygen Species 2017; 4: 303-319. García-Nino WR and Zazueta C: Ellagic acid: pharmacological activities and molecular mechanisms involved in liver protection. Pharmacological research 2015; 97: 84-103. Nalbantoglu I, Tan BR, Linehan DC, Gao F and Brunt EM: Histological features and severity of oxaliplatin-induced liver injury and clinical associations. Journal of digestive diseases 2014; 15: 553-560. Iwu MM: Handbook of African medicinal plants: CRC press. Second ed 2014. Braun L and Cohen M: Herbs and Natural Supplements, Volume 2: An Evidence-Based Guide: Elsevier Health Sciences 2015. Lim T: Anacardium occidentale. In: Edible Medicinal and Non-Medicinal Plants: Springer; 2012; 45-68. Ikyembe D, Pwavodi C and Agbon AN: Hepatoprotective effect of methanolic leaf extract of Anacardium occidentale (cashew) on carbon-tetrachloride-induced liver toxicity in wistar rats. Sub-Saharan African Journal of Medicine 2014; 1: 124. Ciulei I: Methodology for analysis of vegetable drugs. Practical manual on the industrial utilisation of medicinal and aromatic plants. Romania: Center Building 1982. Harborne A: Phytochemical methods a guide to modern techniques of plant analysis: springer science & business media 1998. Encarnação S, de Mello-Sampayo C, Graca NA, Catarino L, da Silva IBM, Lima BS and Silva OMD: Total phenolic content, antioxidant activity and pre-clinical safety evaluation of an Anacardium occidentale stem bark Portuguese hypoglycemic traditional herbal preparation. Industrial Crops and Products 2016; 82: 171-178. Famurewa AC, Showunmi FA, Folawiyo AM, Ogbu PN, Epete MA and Igwe EC: Hepatotoxic and Nephrotoxic Potentials of Aqueous Extract of Stem-Bark of Cashew Tree (Anacardium occidentale L) in Rats. Toxicology International 2015; doi: 0.22506/ti/2015/v22/i3/137634: 108-114. De Beer D, Joubert E, Gelderblom W and Manley M: Phenolic compounds: A review of their possible role as in vivo antioxidants of wine. South African Journal of Enology and Viticulture 2017; 23: 48-61. Gulcin I and Beydemir S: Phenolic compounds as antioxidants: carbonic anhydrase isoenzymes inhibitors. Mini reviews in medicinal chemistry 2013; 13: 408-430. Cichoż-Lach H and Michalak A: Oxidative stress as a crucial factor in liver diseases. World journal of gastroenterology: WJG 2014; 20: 8082. Olajide OA, Aderogba MA, Adedapo ADA and Makinde JM: Effects of Anacardium occidentale stem bark extract on in-vivo inflammatory models. Journal of Ethnopharmacology 2004; 95: 139-142. Olajide OA, Aderogba MA and Fiebich BL: Mechanisms of anti-inflammatory property of Anacardium occidentale stem bark: Inhibition of NF-κB and MAPK signalling in the microglia. Journal of ethnopharmacology 2013; 145: 42-49. Thomas MMG and Barbosa Filho J: Anti-inflammatory actions of tannins isolated from the bark of Anacardwm occidentale Journal of ethnopharmacology 1985; 13:289-300. Stewart RD, Boettner EA, Southworth RR and Cerny JC: Acute carbon tetrachloride intoxication. Jama 1963; 183: 994-997. Zhao J, Zhang Y, Wan Y, Hu H and Hong Z: Pien Tze Huang Gan Bao attenuates carbon tetrachloride-induced hepatocyte apoptosis in rats, associated with suppression of p53 activation and oxidative stress. Molecular medicine reports 2017; 16: 2611-2619. Recknagel RO, Glende EA, Dolak JA and Waller RL: Mechanisms of carbon tetrachloride toxicity. Pharmacology & therapeutics 1989; 43:139-154. Zakrzewska KE, Samluk A, Wencel A, Dudek K, Pijanowska DG and Pluta KD: Liver tissue fragments obtained from males are the most promising source of human hepatocytes for cell-based therapies-Flow cytometric analysis of albumin expression. PloS one 2017; 12: e0182846. Kanchana N and Sadiq AM: Hepatoprotective effect of Plumbago zeylanica on Paracetamol induced liver toxicity in rats. Intl J. Pharm Pharmaceut Sci 2010: 5(1): 151-154. Usmani S and Kushwaha P: A study on hepatoprotective activity of Calotropis gigatea leaves exrtract. Int J. Pharm Sci. 2010; 2: 101-3. Hellerbrand C, Schattenberg JM, Peterburs P, Lechner A and Brignoli R: The potential of silymarin for the treatment of hepatic disorders. Clinical Phytoscience 2016; 2: 7. Mastron JK, Siveen KS, Sethi G and Bishayee A: Silymarin and hepatocellular carcinoma: a systematic, comprehensive, and critical review. Anti-cancer drugs 2015; 26: 475-486. Zhang A, Sun H and Wang X: Recent advances in natural products from plants for treatment of liver diseases. European journal of medicinal chemistry 2013; 63: 570-577. Okonkwo TJN, Okorie O, Okonta JM and Okonkwo CJ: Sub-chronic Hepatotoxicity of Anacardium occidentale(Anacardiaceae) Inner Stem Bark Extract in Rats. Indian Journal of Pharmaceutical Sciences 2010; 72: 353-357. Ramaiah SK: A toxicologist guide to the diagnotic interpretation of hepatic biolochemical parameters. Food and chemical toxicology 2007; 45: 1551-1557. Suurbaar J, Donkor AM, Donkor M, Saeed M, Alimatu-Sadia F and Samuel DF: Effect of methanol extract of Anarcardium occidentale (cashew) stem bark on some biochemical parameters of carbon tetrachloride-induced hepatotoxicity in rats. Int J Pharm Sci & Res 2018; 9(9): 3689-95. doi: 10.13040/IJPSR.0975-8232.9(9).3689-95.